This is based on my recollections of the World Masters Athletics Indoor Championships in 2008, held in Clermont Ferrand, in central France. I enjoyed myself enormously at these championships, which were successful for me both as an athlete and a photographer. I was awestruck by the huge Jean Pellez stadium. Many people felt Linz (home to the last World Masters Indoors, in 2006, and where I made my international Masters debut) was the “best ever” indoor arena, but for sheer size, and completely unobstructed views from every part of the building, this was the best, in my view. What a pity that some of the organisation of the 3rd World Masters Indoor Athletics Championships failed to live up to the quality of the track. I get a privileged view of things, of course. I am fortunate to have the chance to work on the track as a photographer, but I’m also part of the M50 sprint squad from Great Britain. I see things from both sides. I also felt that, amongst the athletes, the Clermont Ferrand Worlds were a fantastically friendly games. I have good friends (and rivals) in the Italian, German, French and USA teams. It was great to meet and race with them again so soon after Riccione. The French meeting officials have taken a lot of criticism in the Masters press since Clermont. Some of it is deserved, yet I know from what was said to me by officials down on the track, that they were aware of most of the problems, and did their best to improve them each day. My own experience, both working and running, supports this. They did try. Some things did improve, but unfortunately, some important things did not. It is a shame that these are probably the memories of Clermont that will get the most publicity. It is the quality of the athletes and the competition that deserve to be remembered most. Call Room procedures, warm up facilities, the random production and display of results and seeding information, and the stupid decision to have the medal ceremonies (before the Saturday afternoon) in the TIC and not the main stadium building are my main criticisms. As a 200m runner, I suffered along with others the worst of the Call Room delays on the Tuesday evening. OK, some of the officials there didn’t help things, but I personally blame the systems elsewhere in the arena. These were too slow at getting seeding information, lane draws and so on to the Call Room in the first place. I’m fortunate to be able to speak a bit of French, Italian and German. Was it too much to expect that the Call Room staff could have done the same? French and (if put under pressure) a bit of English was usually all they would offer. But I share with Call Room staff the sense of frustration I know they felt. Many were staying in the same hotel as me, and they were not proud of the way the Call Room worked. Why were there no proper indoor warm up facilities for anyone, no facilities for hurdlers to warm up, and an information centre (TIC) that was half a kilometre from the stadium? These are issues that I feel we athletes should be asking WMA about. Did the WMA top brass who awarded the championships to Clermont Ferrand really think that what was on offer was adequate for a World Championship? We asked the same questions after Riccione, too, of course. However, these are common failures. Were the warm up facilities in Helsinki for EVACI 2007, or in Poznan for EVACS 2006 any better? No, of course they were not. Are you watching and listening, Ancona 2008, Lahti 2009, Kamloops 2010…? The athletes hope so. Down at trackside, once the athletes had managed to warm up, negotiated the Call Room, and arrived for their event, things were electrifying at times. I have high praise for how well the trackside officials coped. The arena announcers, although limited to French and occasional English, worked themselves hoarse to drum up a good atmosphere in the arena. It was a great shame that the stadium had no big screen for race results. It was an even bigger pity that the meeting programme had no list of athletes and their race numbers. I was more fortunate than most. As a photographer, I obtained a list from the TIC, but it should have been widely available. The announcers were, of course, chauvinistic towards the French athletes. Take Saturday morning as an example, with great French athletes at work in the women’s pole vault and the men’s triple jump. It gave a great atmosphere, but the audience in the stands were not predominantly French, and were loud in support of their own champions too. I can vividly recall the deafening sound of the crowd as I raced off the bend in the M50 4x200m relay with my German friend and rival Rudolf König close behind me. What was not so good was the occasional sight of whole races filled with French athletes, while the preceding and following heats contained none. We were left wondering whether that was the seeding system. Or something more partisan? For me, when I put my camera away, this was my best championships as an athlete. I won the “B” Final of the M50 60m on the Tuesday. But I only found out an hour before the race that there was even going to be a “B” final! It wasn’t in the programme, and no explanation was ever given about why it was added. Fortunately for those of us who took part, we were all warming up for the 200m heats anyway. There were two empty lanes, and I never did find out whether this was because the athletes who should have been in those lanes simply didn’t know the race was on. The same happened when a third semi-final of the M50 60m was added on the Monday evening. No stadium announcement was made. One of my team-mates was simply amazed when he watched the race start without him. The information about it was in the TIC, of course, but the TIC closed promptly at 7pm every evening. Doing four rounds of the M50 200m was hard, especially when the quarter finals started (eventually) at 10.30 on the Tuesday night, and the semi-finals were scheduled for 10.15am next day. No proper chance for a meal, a massage etc in a programme like that. However, I made the final – my first World Championships final in an individual event. The less said about running in that final from lane 1 the better! And beating the very strong German team in the 4x200m relay was something, quite honestly, I had not thought we Brits would do. I was sure we could (and would) get the silver medal. To win gold was a great delight. We ran the second fastest time ever by a GB M50 4x200m squad, even without Steve Peters at the Championships, and wore our medals home with great pride. See you in Slovenia, and again in Ancona. our age group, who had died a few weeks earlier. Why do swimmers have it so easy? This short article arose from watching too much of the Beijing Olympic Games. I enjoy the imagery this article conjures up in my mind. I was musing recently (as you do), on the debate about women’s cycling in the Olympic Games. If you’ve not been paying attention, very briefly, it’s all about why there are so few events for women, compared to the event-rich programme for men. Just a large whiff of British self-interest involved, but if you’ve watched international track cycling recently, you’ll agree it’s justified. After a smug pause to reflect that, with just the odd exception now, track and field for men and women are more or less identical programmes (how different to a few Games back), I got to thinking about how unequally the events are distributed between different sports. Swimmers can now do front crawl, backstroke, butterfly, breaststroke, and even enter races that cater for all four at once. They can indulge these practices over several different distances. Is it any wonder, therefore, that swimming produces multi gold medal winners? It hardly seems fair. I mean, for all we know, we have potential Olympic glory waiting for Britain in events such as backwards running, running while moving your arms and legs in a funny way (not a catchy name, I confess), and in the individual different running styles medley race. Who knows? Don’t get me wrong – I’m not denigrating what swimmers do, but it does make track athletics look a bit limited. OK, so we make up for it in field events, for which there is, as yet, rather a limited set of swimming equivalents. Water-based shot put might prove a poor attraction for spectators, though I’d imagine measurement would be hell for the officials. But even with the equivalents swimming does have, (if you’ll indulge me a little further with this,) things seems to me to be going the way of the pool. Several different types of diving, for instance. Why don’t we have several different styles of long jump? There’s pairs and team synchronised swimming. Why do all our relay teams have to have four Members? When you’re bored, you can make up some others for yourself, to while away the time. Where did all this lead me? Well, with a shudder, I thought what the SCVAC, BMAF, EVACS or WMA championships would be like if we did have the same sort of variety in track and field, and had to offer it right across the age groups. Anyone for a week long BMAF Champs, or a month for a future WMA event? Could we stand it? On the other hand, my sprint training already includes regular backwards running drills, and I’m told I have a funny way of using my arms at times. So, I say bring it on! I’ve had a lot of wind this year. No, not what you are thinking! It seems that almost every time I have raced, since the beginning of June, there has been a strong headwind at the track. It was awful at the Great Britain Masters championships in July, resulting in my personal worst electronic time ever for 100m, though I was content with 6th place in both 100 and 200m given the strength of the opposition, and the reality that I’m 54, and they were all younger than me! Ironically, the British Olympic trials were held at the same track the following week, where a following wind was the problem! By the way, they forgot to give the wind reading for the Birmingham M50 100m final on the results. It was a headwind of 5.0 metres/second. Dire. 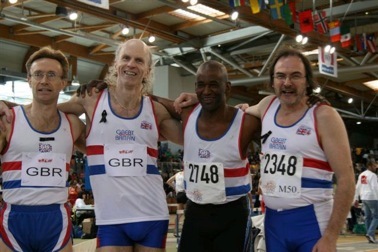 Mind you, the European Veterans (ie Masters) Championships in Slovenia didn’t suffer from the wind. Almost flat calm and 32 degrees C. Wonderful for sprinters. I made both the 100m and 200m finals (one better than two years ago at the Europeans in Poland). I was also clear that I wanted to run under 25 seconds for 200m, and knew that I’d probably need to do this in the 200m semi final if I was going to make the final. Job done. I ran 24.99 for fourth place in the semi. Until I saw the printed results, I was fearful they would round the time up to 25.00, but it stands. My fastest time since I started racing again in 2001. As you will see elsewhere on this web site, I was pretty busy as photographer, too! Domestic racing has been ok, but my own race times have been ruined by the winds. Blackheath & Bromley men have again made the Southern Counties League final on 6 September. Our women’s team missed out by just one point. I’m hoping I get to that competition. For the week beforehand, I am at the European Masters Games in Malmo, Sweden. I have the M50 200m there at 16.55 on Friday 5 September, and a 19.15 flight home. Straight to the Ashford track next day! Fingers crossed. My last Blog entry saw me at the point of departure for the first ever European Masters Games, in Malmo, Sweden, with a tight deadline for getting home again afterwards. Well, all went well. Very well. EMG was a great event. It was a multi-sport gathering, rather like a mini Olympic Games. Track and field athletics was only one of more than a dozen sports involved. The general standard of organisation, and the facilities provided were really very good, from what I saw. Entries were best described as “modest” for the track and field events, but I had no problem with that. Just because the Games carried the tag “European” didn’t mean they had to be a rival in size to the European Masters Championships held just on a month previously. This date clash was unfortunate, but then the Games were not built around the needs and wants of Masters Athletics alone, were they? Some countries supported EMG very well, and there were some outstanding performances, too. The Helenenholm stadium in down-town Malmo was very adequate for the competitions. The standard of local organisation was first class. The whole week stayed dry, and very sunny for most days. Pity about the wind (see previous Blog), which followed me to Sweden and bugged my 100 and 200m races there too! I won the M50 100m and 200m in Sweden. This was nice, of course. The headwind in the 100m was tolerable, but I’d have preferred the flat calm conditions the decathletes had enjoyed a couple of days earlier. By the time the 200m took place, there was a real southerly gale blowing most of the day. Sadly, the wind gauge at the track was nicely screened from this by the seating in the finishing straight. This meant that we had to battle round the turn into a fierce headwind of (I’d guess), -6 or -7 metres per second, only to find that the faint breezes that had eddied around the wind gauge gave official readings of a very slight following wind! There’s no justice. I’d been more nervous about my journey home than anything. I was due to race in the Southern Counties Masters League Final at home on the day after the 200m final in Sweden. I had barely two hours between my 200m and the departure time of my flight from Malmo. Well, suffice it to say that I won the race, was presented with my gold medal, booked a taxi, and travelled to Malmo airport all within an hour of the gun! It was only then that the airline told me the flight was delayed by three hours! I eventually arrived home at one o’clock in the morning, still in my track-suit. By 9.30am, my body was at the Julie Rose Stadium for the League Final. Not sure where I’d left my brain, though. And the Final reserved for me some of the strongest winds of the “summer”. I was blown (backwards) to my slowest 100m and 200m times for several years. Why don’t these winds ever blow from behind? The Final was good competition, held in grim conditions. Blackheath and Bromley retained their men’s title, which was very rewarding. I went straight back to bed. I ended the 2008 season a couple of weeks later with good times to win both the 100m and 200m M50 races at the Kent Masters Championships. Turn-out was poor, though. Having these races so late in the season is a problem. A few weeks rest now.